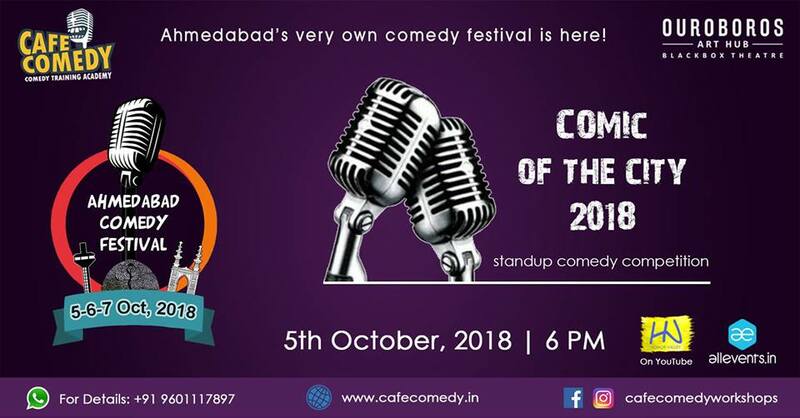 ‘Comic of the City 2018’ is a Standup Comedy Competition in which participates will be performing their standup comedy bit and will be contesting to win the title. The competition will be having two rounds both on the same day and winner will be getting the title, certification and a special gift worthy to the competition as well as each participate will be getting participation certificate. We are inviting all the comics & aspiring comics to participate in the competition. For registration kindly buy a ticket and then contact us at +91 9601117897 for the further form filling process. ‘Ahmedabad Comedy Festival’ is a Comedy Fest Organised by Café Comedy in association with Ouroboros Art Hub, Humor Valley & All Events. This is Ahmedabad’s very own comedy festival which has bunch of events lined up featuring Unique Comedy Shows, Informative Session, Panel Discussion and a Standup Comedy Competition as well. Ahmedabad is going to witness the variety of 30+ comedy types by 19 Comedians of Café Comedy in this 3 day festival and it is going to be epic! So Book Your Tickets Now! You can also buy a Season Pass for all the 6 events together which is available with the special discount both offline & online. About Amit Khuva & Café Comedy: Amit Khuva is a Standup Comedian with experience of 12 Years (2800+ live shows & 500+ TV Episodes). He is the founder of India’s only comedy training academy Cafe Comedy which is also the pioneer group of comedians working for clean comedy concept in Gujarat, India.